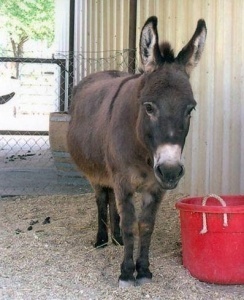 On January 5, 2007, I went to visit a Miniature Donkey who needed a home because the owner was moving out-of-state and could not take Tumbleweed with her. I went there expecting to see an adorable, healthy and well taken care of animal offered for free to a good home. I found instead an overweight (free-fed) mini with "slipper" feet that had foundered in all 4 hooves. In order to rescue Tumbleweed, the owner insisted that we had to take 2 neglected and older goats. We did so, and Tumbleweed and the other goat are living out their lives at Heaven Can Wait.